“I don’t know what’s wrong,” the concern in the doctor’s eyes told my mother-heart that this wasn’t a good thing. Our 1-year-old daughter had spiked at a fever of over 105 for over a week without any other symptoms. Cautiously, the doctor explained his concern over the lack of additional symptoms because this could indicate a more chronic illness like leukemia or juvenile rheumatoid arthritis or all sorts of other options a mother should not be left to wonder about. 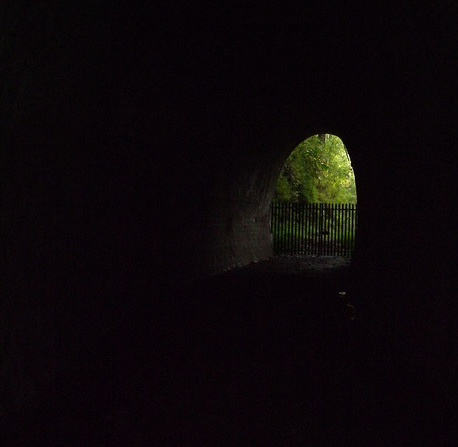 We were completely in the dark, with no answers and no light at the end of the tunnel. Gratefully, a few days later, my daughter’s tiny neck swelled, indicating a localized infection, and the light flickered on. “Wow, that’s just great!” the doctor exclaimed with relief when we showed him. I didn’t feel quite as relieved as he seemed, but I also knew that it meant there was a symptom to treat rather than more dark tunnels. She ended up with a 2 week hospital stay and surgery at a children’s hospital, but once we found the source of the problem, it was ultimately treatable and relatively short-lived. Would the man-from-the-other-side-of-the-world who I loved and I spend our lives together? Would we survive the process of actually making it actually work? How could we raise our interracial family in those cornfields? How do we walk alongside strong friends with crumbling lives? How do we walk through our own days-of-crumbling? What to do when you lose all sight of faith in a loving God? How do young parents survive years of sleepless nights? I’ve waited on pins and needles for results of job interviews, medical tests, bank account balances and academic examinations – some with great results and others not-so-much. In every situation, the waiting-in-the-dark is by far the hardest part. Once there is an answer – good or bad – at least I can begin to deal with it. But darkness? No response? Endless waiting? Unguaranteed outcomes? I rant to myself or those close enough to me who won’t think worse of me for it. I lose myself online, wasting hours with mind-numbing and meaningless activity. I’m not much of a cryer, but sometimes, when the darkness has threatened to consume everything, the tears have slipped down my cheeks in quiet angst. Other times, in uncharacteristic anger, I have beat my fists on a steering wheel, protected by the privacy of my car, pleading with God to catch some faint glimmer of hope. There’s plenty of light – both figuratively and literally – where I live now. The sun shines almost 300 days a year, and blue skies are the norm. Life these days offers a buffer that allows me to step back for the moment and ponder the darker days I’ve walked. What were those years for? I’ve often wondered, or as it sometimes comes out, What-the-hell were you thinking, God? The answers come slowly – I don’t know that I’ll ever fully understand every dark path I’ve walked. But as my soul rests in the light of these days, one of the truths I consistently see about the dark days is how closely God walks alongside those who don’t know where they are. My shouts of where ARE You? fell onto the pages of Job, Ecclesiastes, Lamentations and the Psalms in good company with a whole variety of other hopeless followers. My fears of what happens if it all falls apart? unraveled in the safety and faithfulness of loved ones who knew listening hearts and open arms were as valuable as answered questions and systematically constructed theologies. My questions of will I make it? sunk deep and forced me to grapple with where my strength and hope really lay. My whispers of are You good? echoed beneath every denouncement of pain-in-the-world that I didn’t understand. It was not the ‘unshakable faith’ I’d learned as a young believer. This faith-in-the-dark was one that shook to the core. It was, however, surprisingly stronger. Like so many cantankerous souls in the Bible, it left me unafraid to bring my questions to God – both faith-filled and faithless. It blew my faith open wide to allow the possibility for answers to be beyond myself and my control. Ultimately, it brought me to my knees in surrender of all that I held dear – even my own faith. Lament. As a young believer, I learned a lot about the value of joy. To my understanding, followers of Christ were happy, well-adjusted, and optimistic. But when those values seemed unreachable, I found all sorts of other stories in the Bible about people who followed God fiercely and yet also raged, lost perspective, and doubted. As they lamented the brokenness within and around them, it changed who they were, how they saw the world and interacted with the people in it. Lamenting created an insatiable thirst for the restoration of the broken, and it often compelled them to pursue healing for the very sorrows they lamented. Connect. Because modern society is increasingly fragmented and isolated, connecting in meaningful ways with others will be a pivotal component of how we develop in healthy ways. While it’s certainly true that it’s hardest to find another person in the dark, it’s equally true that when we do, we feel much less alone. Sitting in a corner waiting for someone to find us doesn’t work nearly as well as shouting out, “Is anyone out there?” and listening for a response. Sometimes, all we need is to know we’re not alone and the burden instantly becomes more bearable. Even in the darkest moments, being able to share vulnerably in a safe space can create lasting and permanent change within. Hope. I must admit that in dark days, hope is one of the last things on my mind. And yet hindsight reminds me that it was the darkness of the days that compelled me most strongly toward hope. In my agnostic days, I often commented I didn’t pray at all. In retrospect, I see now that every breath I took was a prayer. I was not at all apathetic about my belief in God, (or in the term my rector Michael Swanson so brilliantly coined, an “apa-theist”), because it shook my soul to imagine that I was left to fend for myself on this chaotic mess of a planet. Even in my greatest moments of angst, my ultimate hope was for hope to actually be possible and not pointless. If the light of my current days has taught me one thing, it’s that stars shine brightest in the darkest places. As much as I love living closer to a city, I will also admit that the dark and empty places I’ve lived have also offered far more beautiful glimpses of the stars precisely because they taught me how to lament, to connect in vulnerable ways to others, and to hope in spite of the brokenness. As the wounded parts heal, I feel a bit like one of those resilient little flowers pushing its way up through a crack in the concrete, a brief glimmer of beauty blossoming from what once felt so very empty and alone. Thank you. Being in a tunnel at the moment this really touched me. It describes some of the things I go through, and some of the lessons I learned (and am learning).